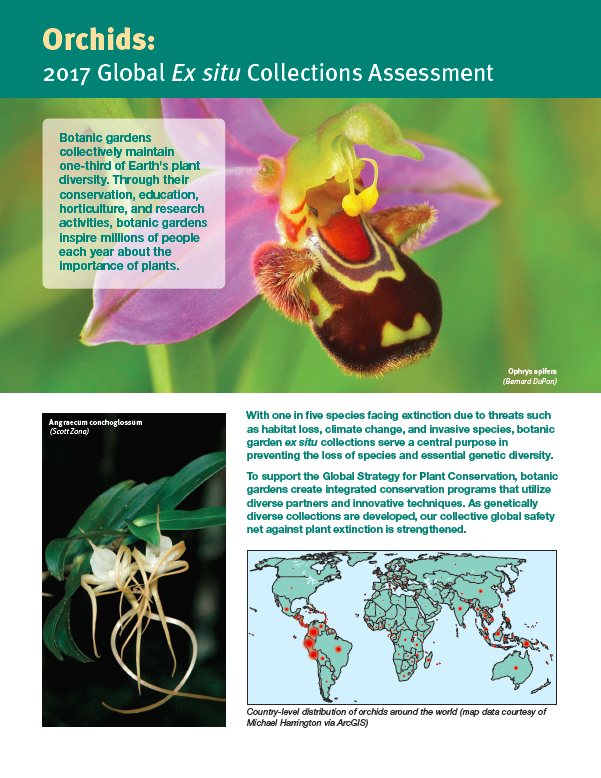 BGCI-US, in partnership with the United States Botanic Garden, have published a global ex situ survey of orchids. One of the largest plant families in the world, orchids occur naturally in nearly every ecosystem on Earth. Orchids are also economically important and often over-collected in the wild. Ex situ collections are a vital conservation measure offering protection to species away from their native habitat and any in situ threats. Ex situ collections can also form the basis of reintroduction and restoration programmes, therefore helping to improve the conservation status of orchid species in the wild. Our report highlights the 35% (272) orchid genera that are not known in ex situ collections, a vital conservation measure that could prevent extinction. Only 36% of orchid species known to be threatened are reported by gardens, and a majority of those collections lack provenance information and adequate duplication across institutions. This means that very few orchid taxa have back-up protection if the threatened in situ populations are lost. We call for orchid ex situ collections to be expanded to contain a greater diversity of species and sufficient genetic diversity to prevent species extinction and allow their use in recovery and restoration programs, especially in biodiverse regions. A big thanks to all the botanic gardens that contributed data to this assessment.